Measures to protect children with nut allergies are becoming increasingly absurd and hysterical, say experts. A peanut on the floor of a US school bus recently led to evacuation and decontamination for fear it might have affected the 10-year-old passengers. Such extreme steps to reduce exposure to nuts are not isolated and are fuelling fear and anxiety, reports the British Medical Journal Online. A UK allergy expert said a similar "epidemic" was present in Britain. Professor Nicolas Christakis, a professor of medical sociology at Harvard Medical School, told the BMJ there was "a gross over-reaction to the magnitude of the threat" posed by food allergies, and particularly nut allergies. In the US, serious allergic reactions to foods cause just 2,000 of more than 30 million hospitalisations a year and comparatively few deaths - 150 a year from all food allergies combined. In the UK there are around 10 deaths each year from food allergies. Professor Christakis said the issue was not whether nut allergies existed or whether they could occasionally be serious. Nor was the issue whether reasonable preventative steps should be made for the few children who had documented serious allergies, he argued. "The issue is what accounts for the extreme responses to nut allergies." He said the number of US schools declaring themselves to be entirely "nut free" - banning staples like peanut butter, homemade baked goods and any foods without detailed ingredient labels - was rising, despite clear evidence that such restrictions were unnecessary. "School entrances have signs admonishing visitors to wash their hands before entry to avoid [nut] contamination." He said these responses were extreme and had many of the hallmarks of mass psychogenic illness (MPI), previously known as epidemic hysteria. Often seen occurring in small towns, schools and other institutions, outbreaks of MPI involve healthy people in a flow of anxiety, most often triggered by a fear of contamination. Being around individuals who are anxious heightens others' anxiety, leading to a self-perpetuating cycle which can spiral out of control. "Well intentioned efforts to reduce exposure to nuts actually fans the flames, since they signal to parents that nuts are a clear and present danger," said Professor Christakis. John Collard, nurse consultant and clinical director of Allergy UK, said people in Britain were also going overboard in their reaction to allergies. "I heard a similar story in the UK about a school making children wear gowns over their clothing during meal times so there would be no contamination fear from milk. "There is a tendency to go over the top. "Food allergies can be deadly, and every death is clearly a tragedy so we need to do what we can to prevent them. But you have to balance that against the impact on the quality of life of everyone else. "The risk has been blown out of all proportion." He said most people with diagnosed food allergies had only mild reactions. Also, many cases labelled as food allergy were simply intolerance to food and posed no health threat, he argued. Food labelling is also to blame for fuelling fear, according to Mr Collard. "People read on food labels that a product has been made in a factory with nut-based products and it creates the impression that nuts are everywhere." He said some parents avoided taking their children to birthday parties and restaurants because they were worried about triggering an allergy. 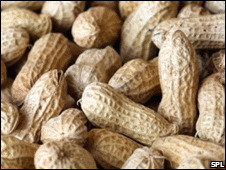 However, a recent study has suggested that early exposure to peanuts actually reduces, rather than increases the risk of allergy. Mr Collard said this might well change the current advice to avoid eating nuts for the first years of life.